Looking for a local supplier of butane or propane bottled gas? Do you need to find bottled gas refills for your cabinet heater? portable heater, a catering van cooker, or another gas appliance that uses LPG? Our free to use local business directory features business and companies that supply bottled gas in Leeds. Recognised as one of the most economical types of fuel, common types of bottled gas are butane, propane, and patio leisure gas which is often a mixture of the two combined in one cylinder. Bottled Gas Stockists in Leeds will usually offer for sale popular brands of bottled gas along the likes of Calor, Energas, or Flogas. These companies offer a large product range of bottled lpg (liquified petroleum gas) gas suitable for fitment to all types of portable cabinet heaters, high output garage space heaters, workshop blower heaters, fork lift trucks, as well as leisure and cooking appliances such as barbeques, cooking grills, fryers, stoves, and patio heaters. You can choose from a large range of different sized bottles (also referred to as cylinders) of LPG gas depending on your particular appliance. Butane gas is commonly supplied by your local stockist in a small to medium sized cylinder for fitment to cabinet heaters, plaque heaters, and camping type stoves and cookers. 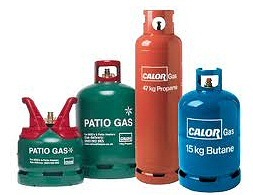 Propane gas is available in small, medium, and large cylinders up to 47kg in size. These are commonly used for commercial applications such as burning torches, gas powered flood lights, and high powered space heaters. Leisure gas is most commonly used for patio heater applications. All stockist’s and agents in Leeds have a collection service where you can collect (or exchange) bottled gas in person. This is convenient especially if you have your own transport and the stockist is close to where you work or live. Most users of bottled gas choose to have their fuel delivered. All Leeds Bottled Gas suppliers offer this service throughout their local areas. The delivery of cylinders of butane and propane gas makes good sense especially if you require a “spare bottle” to keep on-hand to ensure you never run out during those cold winter spells.